Bananas are standard fare for breakfast at our house. After awhile, even I get sick of bananas, so this is a welcome change. In case you were wondering, the secret is a tiny bit of almond extract. 1. 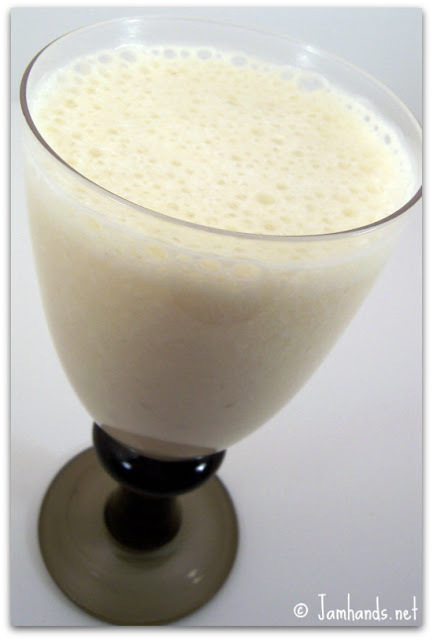 In a blender, add 1 cup milk, 1 cup ice cubes, 1 banana, 1 tsp. almond extract and 1 tsp sugar (optional). Blend until smooth. Recipe courtesy of Penzeys One magazine. YUM! I never have enough to do with almond extract - this'll be perfect! Yum Yum Yum! P.S. I just had oatmeal with Bananas in it. It's a staple in our house too! Gonna give this a whirl!